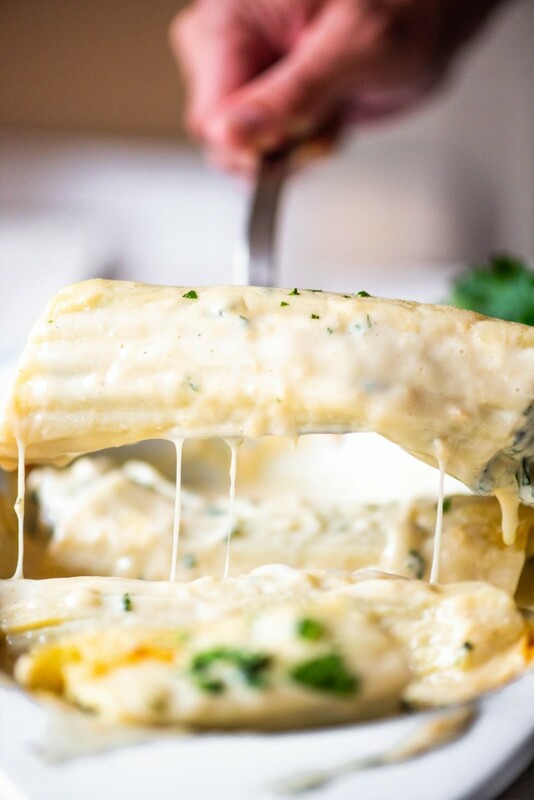 This Chicken and Spinach Manicotti is super easy to make, and smothered in a Copycat Olive Garden Alfredo Sauce. Plus, a hack for filling manicotti! 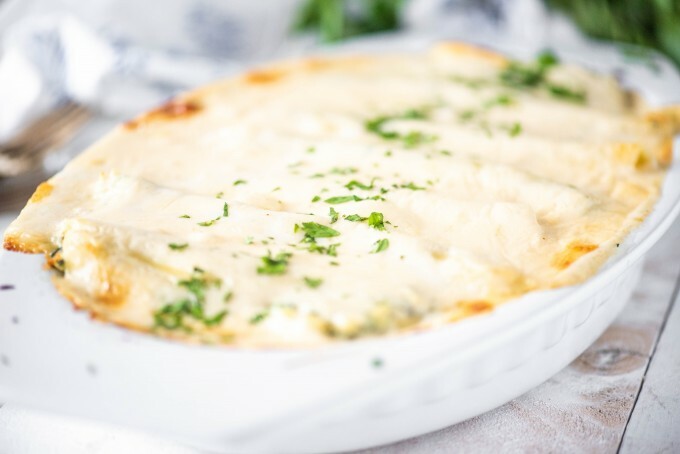 Chicken & Spinach Manicotti is a dish that can be easily made with minimal effort, especially when you just feel like throwing something together quickly! I’m a little picture-happy lately, if you couldn’t tell. Pictures are worth a thousand words, except for SEO purposes. So I need to find more to say. 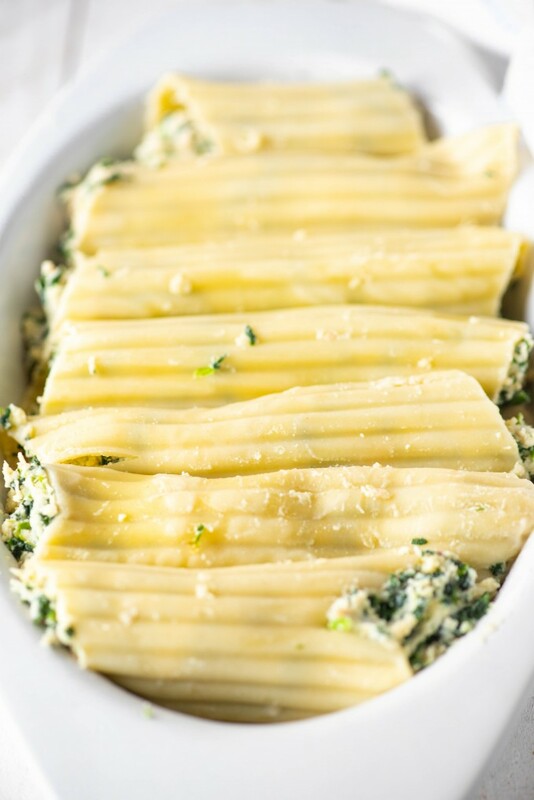 So this spinach manicotti – its pretty much the best “leftover reboot” recipe that I can come up with. 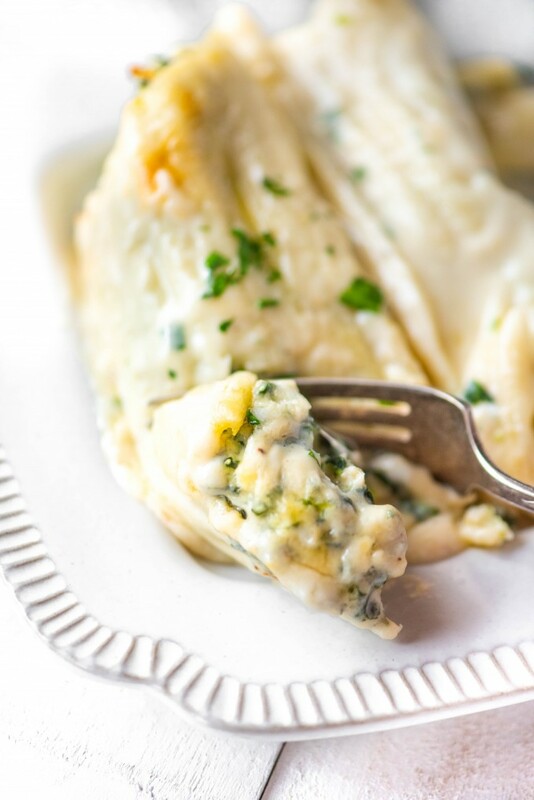 It uses up leftover chicken (or a grocery store rotisserie), gets thrown together with a few other basic ingredients, gets smothered with Alfredo (Monday’s post), and then is baked to make all the cheese warm and gooey. I dare you to find someone that doesn’t love this. I have also made this recipe with stuffed shells, so if thats more your speed, go for it. I always have wondered how other people fill pastas, since so many other recipes say, “spoon filling in.” What does that even mean? That sounds like it is going to take 8,000 years and be super tedious, and ain’t nobody got time for that. That’s why I use a piping bag/Ziploc bag with a big corner cut off. I can squeeze all the filling in and be done filling the pasta in under 2 minutes. Piping bag – I recommend using a piping bag to fill the manicotti for an easy clean up. These Disposable Decorating Bags are perfect to use and toss when you’re done! Baking dish – These Baking Dishes are great for any kind of baking. You’ll get some great use out of them! Spatula – You always need a good set of spatulas in your kitchen to use for any recipe. This Silicone Spatula Set is perfect for mixing and they are dishwasher safe! Bring a large pot of salted water to a boil; add the manicotti and cook until the pasta is al dente. Drain and set aside. In a small saute pan, cook the spinach in 1 T olive oil until wilted. Remove to a cutting board and roughly chop. 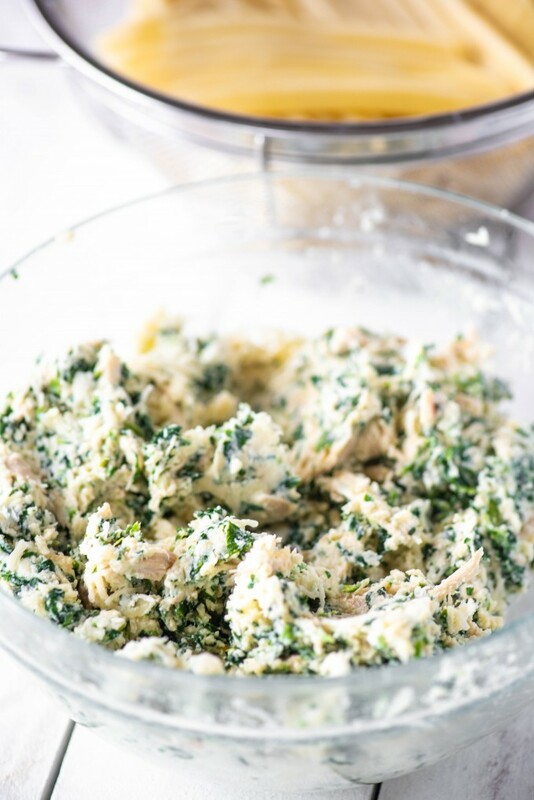 In a mixing bowl, mix the ricotta cheese, ¾ italian blend cheese, shredded chicken, spinach, parmesan cheese and and egg. Spoon the mixture into a piping bag or a large Ziploc bag with the corner cut off (the hole needs to be large enough for the filling to pass through. Ladle alfredo sauce over the bottom of a 13 x 9 rectangular baking dish. Squeeze the filling into the manicotti tubes and arrange them side by side in the baking dish. Ladle additional sauce over the top of the pasta, and sprinkle with the remaining ½ cup of cheese. Bake for 20 minutes. Cool slightly, sprinkle with parsley, and serve. i do a lot of meal prepping and freeze a good amount of what I prep. Have you tried freezing this? You could definitely freeze the filled pasta ahead of time, but I’ve never tried doing the sauce. Cream sauces are so finicky sometimes. It’s fast enough to make that I might freeze the pasta and then just make the sauce fresh. should be cooked before freezing? Yes, it should be cooked. I would not freeze it with the sauce, though. Omggggg the zip lock Baggie tip just saved me 8 years of spooning agony, thank you! You’re so welcome! It works great for stuffing pasta shells too ? 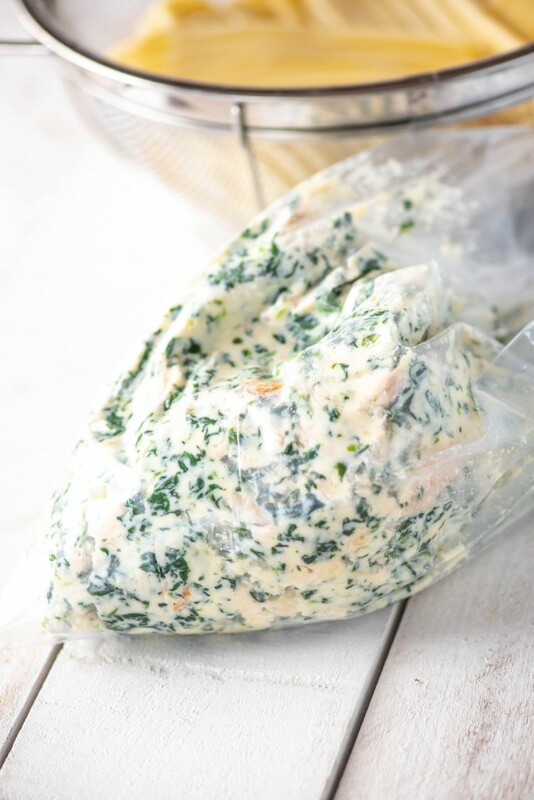 What is your Alfredo sauce recipe? Good morning Michelle! So odd, it used to be linked right in the recipe, not sure why it no longer was. Thanks for letting me know, the link is now in the recipe. Just in case, here is the URL- http://www.gogogogourmet.com/copycat-olive-garden-alfredo-sauce/ Let me know what you think!! Hi Ashley, I would say it makes 4-5 servings. I make this for my family of three (well, 2.5!) and it usually feeds us for two meals. Hope that helps! I absolutely love your tips-keep them coming! The ziplock baggie trick will save me hours! ok, found tomorrow’s dinner recipe! yummy! I just found a home for the Swiss chard from my weekly CSA, my leftover homemade ricotta, and leftover roasted chicken from two nights ago! I added a big dollop of pesto and a minced shallot to the sautéed Swiss chard. I can’t wait until dinner tonight! Thank you for the ziploc tip and this great recipe! Love the piping tip! Make this delicious meal so much easier to prepare! I love that you can freeze this recipe! I think it would be perfect to take to a family who just had a baby or moved in to a neighborhood. did you cook the manicotti before you stuffed them? Absolutely love this meal. I am a very picky eater, but this taste amazing. I did add a little garlic and Tabasco sauce, which is what I use in spinach dip. Thanks for the recipe! This is definitely one of our favorite dinners.